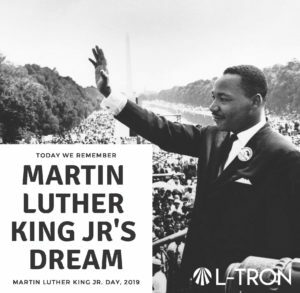 L-Tron | How can you honor Martin Luther King Jr Day? More than a federal holiday, how can you honor Dr. Martin Luther King Jr Day? Dr. Martin Luther King Jr Day (MLKday) falls annually on the third Monday in January each year. The day is meant to commemorate Dr. King and the incredible work he did to end racial segregation and push for quality in the United States. The date typically falls around his birthday, January 15th. More than a federal holiday, it is important to look back on our progress towards equality, and understand what needs to be done to keep the dream of equal rights (for all) moving forward. Who was Dr. Martin Luther King Jr? Dr. Martin Luther King was an activist who played a pivotal role in the civil rights movement. He believed strongly in non-violent protest, which set the tone of the civil rights movement throughout the 50s and 60s. He is well-known for his “I have a dream” speech, given on the steps of the Lincoln Memorial, which called for an end to racism and segregation in the United States. It’s amazing to think that that world changing speech was given over 55 years ago. As time goes on, it is important to remember Dr. King, the influence he had, and why the United States is built on equality and justice for all. What are some things you can do to properly honor the day? Learn about the 6 principles of non-violence that Dr. King spoke about. Click to read more here. Listen to Dr. King’s infamous “I have a dream speech.” Click here to listen. Communities may have parades & events to honor the day – look up what’s happening in your area. Atlanta is the hometown of Dr. King – see what “the King Center” is doing to recognize him. Questions? Interested in learning more about L-Tron’s company culture & Martin Luther King Jr Day?